CSKA Moscow kept its great momentum going and remained undefeated in Group E by downing Alba Berlin 57-75 in the German capital on Friday. CSKA joins Real Madrid atop Group E, each with a 2-0 record. Alba dropped to 0-2. 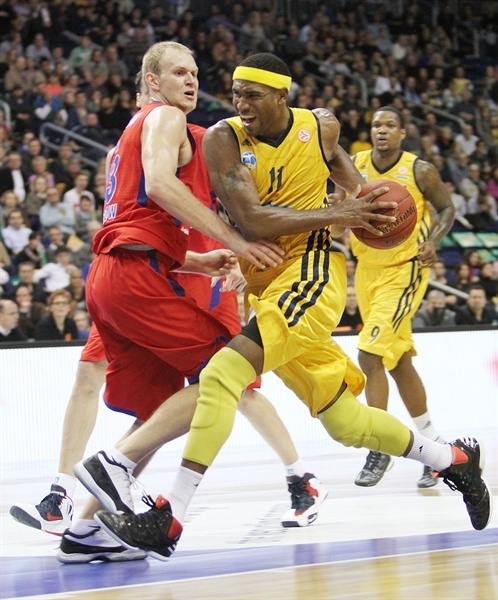 CSKA grabbed its seventh consecutive win in the competition and stayed undefeated on the road in the 2012-13 Turkish Airlines Euroleague. 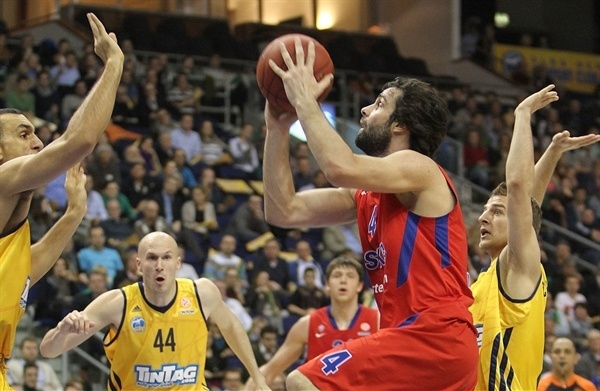 Milos Teodosic led the winners with 17 points. 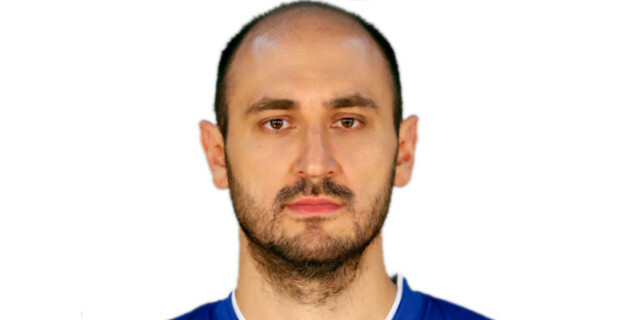 Nenad Krstic added 15 on 9-of-10 free throw shooting while Viktor Khryapa had 10 and 10 rebounds for CSKA. DaShaun Wood led Alba with 14 points and Derrick Byars added 11. 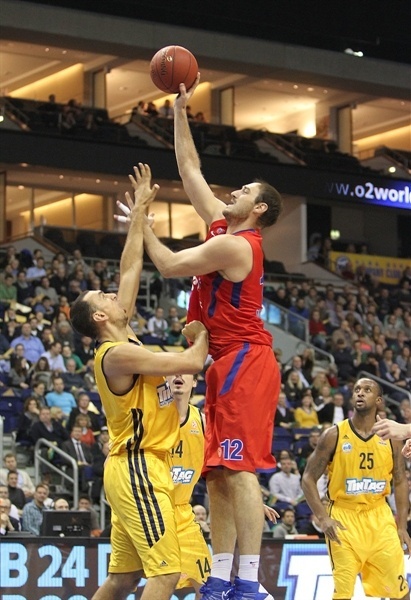 Krstic led a 2-12 run that allowed CSKA to get a 13-24 margin at the end of the first quarter. CSKA extended its margin to 28-40 at halftime but Alba managed to get within 47-53 on a three-pointer by Heiko Schaffartzik late in the third quarter. It didn't last long, as CSKA improved its defense, boosted its margin to 49-68 behind an outstanding Khryapa and never looked back. 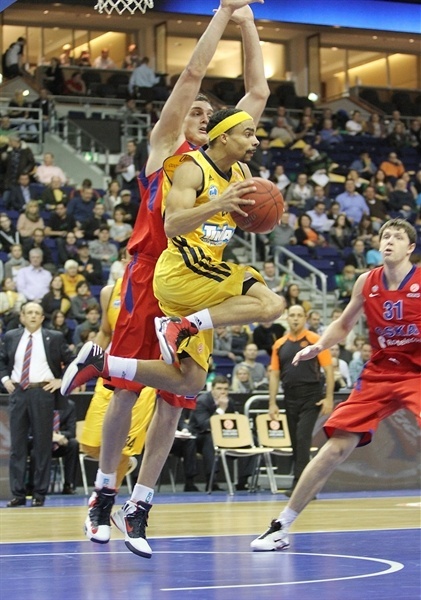 Khryapa got CSKA going with a fade-away jumper that Zach Morley matched with a jump hook in the lane. Je'kel Foster scored off a steal to give Alba its first lead, 4-2. Dionte Christmas struck from downtown, but Wood nailed his own shot from beyond the arc to restore a 7-5 Alba edge. Alba tried to add more fire power by bringing Schaffartzik and Nihad Djedovic off the bench. Teodosic hit a shot and bettered Byars's jumper with a corner triple for a 9-10 CSKA lead. Sven Schultze swished a six-meter jumper, but Vladimir Micov scored around the basket and free throws by Teodosic gave CSKA an 11-14 edge. Alba kept struggling to score and Krstic soon made it a 5-point game. Byars downed a jumper, but Krstic followed foul shots with a layup. Aaron Jackson shined with a fast break layup and an unstoppable Krstic made it a double-digit game, 13-24, after 10 minutes. CSKA tried a taller lineup with Sasha Kaun and Krstic together on court. Deon Thompson nailed a five-meter jumper, which Kaun erased with a layup. Krstic split free throws and a corner jumper by Djedovic brought the hosts a bit closer, 17-27. Christmas scored in penetration, as the game turned into a physical battle, with outstanding blocks by Khryapa and Morley on almost consecutive plays. Albert Miralles took over with a power layup – and the free throw that came with it. Teodosic scored in the low post and a fast break layup by Vladimir Micov made Alba call timeout at 20-33. Yassin Ibdihi scored around the basket, but Teodosic bettered that with a three-pointer. Byars shined with a driving basket and free throws by Wood gave Alba some hope at 26-36. Kaun made free throws and a fast break dunk by Khryapa boosted the guests' lead to 14. A layup by Foster fixed the halftime score at 28-40. Both teams struggled to score after the break until Kaun dunked. Wood immediately answered with an easy basket in transition and a fast break layup by Byars brought Alba within 32-42. CSKA kept missing open shots and Wood sank a one-handed floater in the lane to get Alba within single digits. Wood kept pushing Alba with a driving layup, but Kaun silenced the crowd with a power slam in traffic. Micov buried a corner three-pointer to restore a 36-47 CSKA lead. Djedovic stepped up with a layup and Foster buried a jumper, but Krstic kept CSKA way ahead, 40-49. Djedovic caught fire with a wild driving layup, but Khryapa followed a baseline jumper with a two-handed slam before Alba called timeout at 42-53. Thompson scored down low and a three-pointer by Schaffartzik made it 47-53. Free throws by Krstic and Teodosic gave CSKA a 47-57 margin after 30 minutes. Miralles and Aaron Jackson traded layups early in the fourth quarter and a driving basket by Anton Ponkrashov made it a 12-point with eight minutes to go. CSKA kept dominating the game with outstanding defense, forcing Alba to use long possessions without finding open shots. Khryapa collected a steal and Jackson struck from downtown at the other end to break the game open, 49-64. Khryapa sank a jumper off a timeout and a fast break layup by Jackson sealed the outcome, 49-68, with six minutes left. Wood swished a three-pointer and Byars copied him soon after that, but Teodosic and Krstic kept CSKA way ahead. By the time Ponkrashov shined with a fast break basket, everything was said and done. 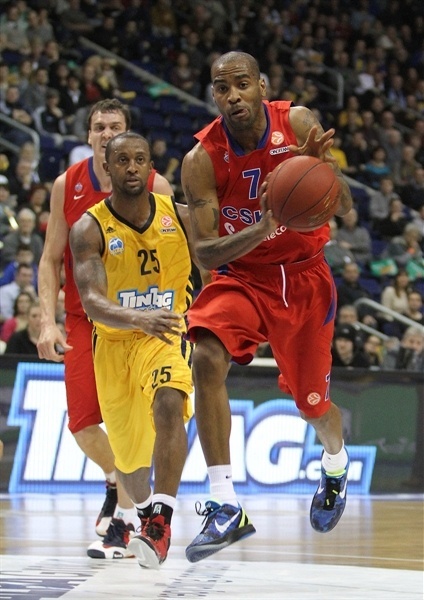 CSKA confirmed its good momentum with another road win. "Having a referee injured like this put a bad end to this game. I wish him luck and may he get well soon. We had already injuries of our players here this season and seeing this happen again was stressful. About the game: CSKA completely deserved to win this game. Before the game CSKA for me was one of the favorites for the title, but having seen how they played today without Sonny Weems and other important players, they definitely deserve the role of the main favorite of the whole competition. "For us, even with our certain difficulties we were there. We showed certain character and to a certain moment were in the game. But the small things changed the game again into the direction of the team with the better quality. Against such a strong opponent, which has faster and more athletic guys it is hard to find solutions. Individually, Deon Thompson completely lost his rhythm with his 2 early fouls. It was hard for him to find his rhythm later in the game, when he made the third foul one right away. I am really satisfied with how Dashaun led the team with the energy he put in the game with each action. This is the way one of our leaders has to take over the game." 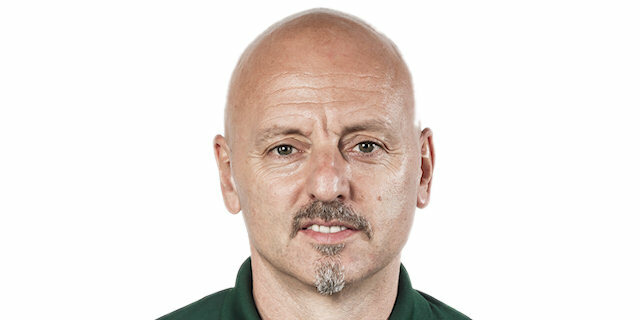 "First of all let me wish good luck for the referee Mogulkoc, who had this horrible accident two minutes before the end of the game. We hope he will be back soon. As for the game: We were coming from a difficult week; we missed Weems, who had problems with his ankle and we are still without Vorontsevich and Erceg. Papaloukas could not travel for visa reasons. So we had to reshape our team and ask some of our players to play a different position. 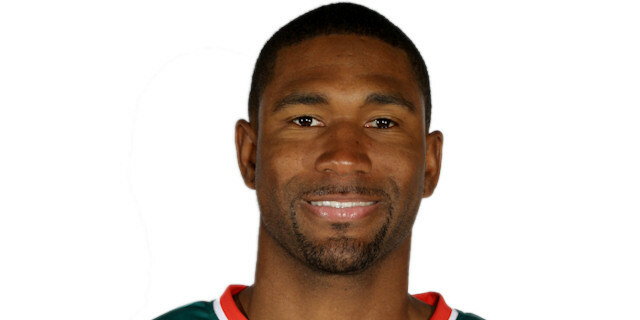 For example, Aaron Jackson played very good at the two position the whole game. My players stepped up in a difficult moment with a great team performance for 40 minutes. "Even against a very strong pressure defense from Alba, who forced 14 turnovers, we offensively always found a good shot and earned fast breaks out of our defense. We managed to use our strength inside with Krstic to create open shots on the perimeter. This was a very important win for us on a very difficult court against a very good team. With the normal Top 16 system, Alba would be out after this second loss, but with the new Top 16 of 14 games, anything can happen. Alba, when they recover their shape, surely will be able to cause some surprises." "We ran into a very good opponent today and had too many breakdowns on defense, breakdowns on rebounds and turned the ball over too often. We cut the deficit to 6 in the third quarter, but we could not overcome. Nevertheless I think we did some good things out there, which we can take away. We are playing better as a team now and Dashaun played aggressive like he used to be earlier in the season. That's what we need from our leader. " "This was a very good win for us. We played very good on defense. We were without Sonny Weems, Vorontsevich, Erceg and Papaloukas, But you could see that we are a very good team, which has a lot of other good players, who step up when it is needed. All the players on the team understand that we are on the same page and that we have to play unselfish team basketball to reach our goal, which is to win the Euroleague. "